Even though the television says it’s only 85 degrees outside, inside feels like a swampy 96. Such conditions are perfect, so my mother thinks, for scrubbing down the fridge. Even splitting the task and using a mop (those sponge mops are great for this), within a minute I’m dripping sweat and my chest seizes up, making it more difficult to breathe. When my mom starts pointing out spots I’ve missed or making suggestions for better ways to finish the task, I respond by screaming her head off. Yep, I’ve just had a mental meltdown over cleaning the fridge. While a meltdown can happen to anyone (especially during hot weather) there are extra factors that can make even the coolest lupus patients moody, irritable and prone to outbursts. Just the day-to-day trials and frustrations of the lupus itself can contribute to stress, depression, and anxiety. In addition, some of the most common lupus medications, such as prednisone, can shorten our fuse in additional ways. We can get so caught up in the physical side-effects of lupus and its treatment, that the emotional ones can often slide by without much attention. First of all, it’s important to keep a balanced view of your lupus. Yes, my mother was annoying me with her back-seat cleaning advice, but at the same time, I didn’t tell her I was having trouble breathing nor did I stop to take a break. With lupus, the people around you may have no idea if you’re suddenly experiencing a change of symptoms or if you’re just grumpy. They aren’t psychic and it’s not fair to expect people to become so. Yelling at my mom for something that I could have better controlled, was not the right move. On the other hand, if the people around are still pushing you despite knowing that you’re having trouble, then a little sharpness might be what’s needed to hold your boundaries. Each situation is going to be different and may need a different approach. Learn: Read up on the medications that you are taking for potential psychiatric side-effects. Your doctor and pharmacist are good sources for this, but you can find plenty on the internet as well. Just don’t forget to use your best judgement when deciding which sites to believe – and remember that every lupus patient is unique, so simply because a certain drug can have a certain effect, doesn’t automatically mean that there might not be some other cause for your feelings. Know Thyself: Piggybacking on the previous point, it’s important to also know yourself. If you’ve always been easily ruffled or irritated, then there is the chance that lupus medications might make you even more short-tempered. If you’re usually pretty even-keeled, like I am and you find yourself snapping at people more than normal, that can be a red flag. 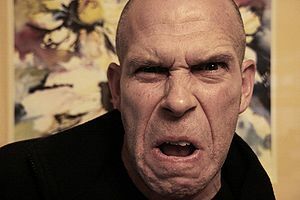 Outbursts can also be triggered by events – I recently had two more medications added to my treatment and, obviously, I’m less than thrilled. Add in a hot day, grimy house chores and then a sudden chest tightness? Nitroglycerin couldn’t be a more volatile mix. Keeping a journal can help you track your moods and uncover any patterns. Create Some Space: Sometimes you’re just having a bad day. If I know I’m in a grumpy, bite-your-head-off kind of mood, I try to avoid being around people. If you can spend a quiet day somewhere where no one will bother you, that might be the break you need to regain your composure. Libraries and bookstores have always been great refuges for me. Movie theaters are another good option (especially if you catch a comedy). Even locking yourself in the bathroom for a quickie spa break can help you relax, and clear your head. And if you’re at work and can’t get away for an hour? Head to the bathroom or break room. Running cold water or an ice cube over your pulse points can instantly start negating some of the physical reactions to stress and anger (fast breathing, increased heart rate). Limit Stress: Summers here in New York can be absolutely brutal and the heat shortens everyone’s tempers. Don’t help it. Keep cool anyway you can: stay in air conditioning if heat causes you distress, dress appropriately, and stay hydrated. If you have the cash, it might be worth it to utilize taxis if standing in a public transportation station will leave you feeling like a sardine stuck in the oven. My favorite summer time tip: take a quick run through any park sprinkler with the kids. While it might not do wonders for your hair or makeup, the cold water and evaporation process will keep you cool as you go about your day. Switch Gears: Had a bad morning? Don’t dwell on it all day. If you find yourself going back to the same things and getting angry over and over, try to force yourself to switch gears. Write a to-do list for tomorrow, clean something, experiment with a new recipe (summer is the time for smoothies), write a blog post about how to not freak out *ahem*… listen to music or start a new book. Watch a funny movie. Go for a run through a sprinkler. Giving yourself some mental space from what’s setting you off can be as important as giving yourself physical space. Get Help: If outbursts are endangering your job or your relationships, then consider seeking a professional opinion. After all, losing your job because you keep losing your temper isn’t really going to make you any happier, now is it? Say Sorry: Everyone loses their temper at some point in life. If stress piles up and you blow your top, once you’ve gotten a hold of yourself, just say ‘sorry’. A sincere ‘sorry’ is probably some of the best damage control after the fact. If you’ve snapped at someone who knows nothing about lupus, this may be a good time to explain how lupus affects you. It still may be a good opportunity to remind someone that you have an illness and that sometimes you lose your cool. Now to take my own advice and go patch things up with my mom. How does lupus affect your moods? What are your tips for coping? Subscribe for updates! This entry was posted in Uncategorized and tagged advice, anger, chronic illness, coping skills, depression, emotions, health, illness, journaling, lupus, stress, Systemic lupus erythematosus. Bookmark the permalink. ← Lupus and Work: What are your options?